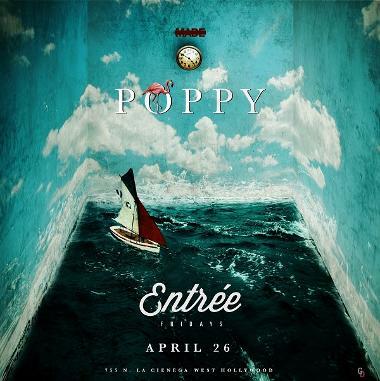 ‘POPPY’ opens as a hybrid nightclub concept portraying a fantasy world transporting into an underlying stream of consciousness filled with the extensive menagerie of characters from a storybook setting. Poppy features a private room housing an exclusive bar under a curved upholstered ceiling where it will be sure to allow Hollywood’s Royalty to imbibe the night away in comfort and luxury. Throughout the venue, guests are whisked away feeling lost in a surrealistic dream, finding themselves among the whimsical bohemian cast of modern mermaids, peacock poppies, garden gypsies, baroque layers, human animals with storytellers, all while listening and engaging with great live music, socializing and dancing. Lounge in the indoor/outdoor patio area, receiving personalized poems and caricature portraits, as bottle spirits are encapsulated in oversized roses and oyster shells and crystallized bathtubs, correlated by their matching roll-playing hostesses.